From the Smithsonian Magazine August 2008 issue, "1968 Democratic Convention," by Haynes Johnson -- As delegates arrived in Chicago the last week of August 1968 for the 35th Democratic National Convention, they found that Mayor Richard J. Daley, second only to President Lyndon B. Johnson in political influence, had lined the avenues leading to the convention center with posters of trilling birds and blooming flowers. Along with these pleasing pictures, he had ordered new redwood fences installed to screen the squalid lots of the aromatic stockyards adjoining the convention site. At the International Amphitheatre, conventioneers found that the main doors, modeled after a White House portico, had been bulletproofed. The hall itself was surrounded by a steel fence topped with barbed wire. Inside the fence, clusters of armed and helmeted police mingled with security guards and dark-suited agents of the Secret Service. 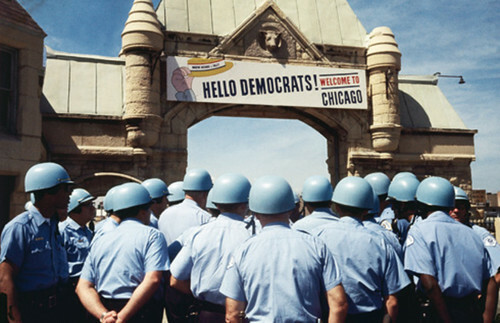 At the apex of the stone gates through which all had to enter was a huge sign bearing the unintentionally ironic words, "HELLO DEMOCRATS! WELCOME TO CHICAGO." If this Potemkin village setting weren't enough to intensify anxiety among Democrats gathering to nominate their presidential candidate, the very elements and conditions of Chicago life contributed to a sense of impending disaster. The weather was oppressively hot and humid. The air conditioning, the elevators and the phones were operating erratically. Taxis weren't operating at all because the drivers had called a strike before the convention began. The National Guard had been mobilized and ordered to shoot to kill, if necessary. 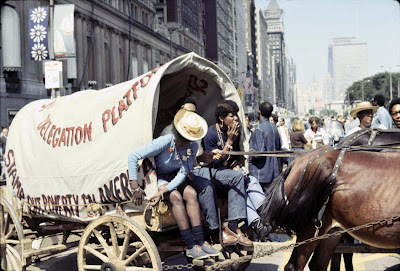 Even as delegates began entering this encampment, an army of protesters from across the country flowed into the city, camping in parks and filling churches, coffee shops, homes and storefront offices. They were a hybrid group—radicals, hippies, yippies, moderates—representing myriad issues and a wide range of philosophies, but they were united behind an encompassing cause: ending the long war in Vietnam and challenging Democratic Party leaders and their delegates to break with the past, create change—yes, that was the term then on every protester's lips—and remake the battered U.S. political system. 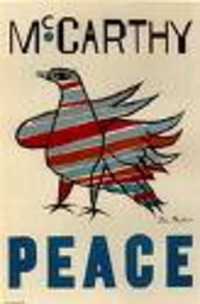 As Rennie Davis put it, speaking as project director for the National Mobilization Committee to End the War in Vietnam, the largest and most important group for the planned protests: "Many of our people have already gone beyond the traditional electoral processes to achieve change. We think that the energies released...are creating a new constituency for America. Many people are coming to Chicago with a sense of new urgency, and a new approach." What followed was worse than even the most dire pessimist could have envisioned. The 1968 Chicago convention became a lacerating event, a distillation of a year of heartbreak, assassinations, riots and a breakdown in law and order that made it seem as if the country were coming apart. In its psychic impact, and its long-term political consequences, it eclipsed any other such convention in American history, destroying faith in politicians, in the political system, in the country and in its institutions. No one who was there, or who watched it on television, could escape the memory of what took place before their eyes. Include me in that group, for I was an eyewitness to those scenes: inside the convention hall, with daily shouting matches between red-faced delegates and party leaders often lasting until 3 o'clock in the morning; outside in the violence that descended after Chicago police officers took off their badges and waded into the chanting crowds of protesters to club them to the ground. I can still recall the choking feeling from the tear gas hurled by police amid throngs of protesters gathering in parks and hotel lobbies. For Democrats in particular, Chicago was a disaster. It left the party with scars that last to this day, when they meet in a national convention amid evidence of internal divisions unmatched since 1968. To understand the dimensions of the Democrats' calamity, recall that in 1964, Lyndon B. Johnson had defeated Barry Goldwater for the presidency with 61.1 percent of the popular vote, a margin eclipsing even the greatest previous electoral victory, by Franklin D. Roosevelt over Alf Landon in 1936. In mid-1964, passage of civil rights legislation had virtually ended legal segregation in America. Optimists had begun talking about America's entering a "golden age." By that next summer, however, the common cause of blacks and whites marching together had been shattered as riots swept the Watts section of Los Angeles and, over the next two years, cities across the country. In that same initially hopeful year, the Johnson administration had made a fateful commitment to keep increasing the numbers of troops to fight a ground war in Vietnam, an escalation that would spawn wave upon wave of protest. In the 1966 congressional elections, Democrats—who had been experiencing the greatest electoral majorities since the New Deal—sustained severe defeats. As 1968 began, greater shocks awaited the nation: North Vietnamese forces launched the Tet offensive that January, rocking U.S. troops and shattering any notion that the war was nearly won. Johnson withdrew from the presidential campaign that March. Martin Luther King Jr. was assassinated in Memphis in early April, and another succession of riots swept the cities. Robert F. Kennedy, heir to the Kennedy legacy, had his presidential campaign cut down by an assassin's bullet after winning the critical California primary in June. It was against this extraordinarily emotional background that the Democrats convened. Hubert H. Humph- rey, LBJ's vice president, had sat out the primaries but secured delegates controlled by the party establishment. Senator Eugene McCarthy—the antiwar candidate whose strong second-place showing in the New Hampshire primary had demonstrated Johnson's vulnerability—had abundant forces in the hall, but they were now relegated to the role of protesters. Senator George S. McGovern had rallied what remained of Kennedy's forces, but he, too, knew he led a group whose hopes had been extinguished. From whatever political perspective—party regulars, irregulars or reformers—they all shared an abiding pessimism over their prospects against a Republican Party that had coalesced behind Richard M. Nixon. They gave voice to their various frustrations in the International Amphitheatre during bitter, often profane, floor fights over antiwar resolutions. The eventual nomination of Humphrey, perceived heir to Johnson's war policies, compounded the sense of betrayal among those who opposed the war. The bosses, not the people who voted in the primaries, had won. The violence that rent the convention throughout that week, much of it captured live on television, confirmed both the Democrats' pessimism and the country's judgment of a political party torn by dissension and disunity. In November the party would lose the White House to Nixon's law-and-order campaign. In the nine presidential elections since, Democrats have won only three, and only once—in 1976, after the Watergate scandal forced Nixon to resign in disgrace—did they take, barely, more than 50 percent of the votes. Changes in party rules have curtailed the establishment's power to anoint a presidential nominee, but the ideological divides have persisted; thus this year's rival candidates battled bitterly to win state primaries. And after such a divisive primary season, in the end the nomination still depended on the "superdelegates" that replaced the party bosses. OK, what great lesson are Black citizens supposed to draw from this event? Nixon's southern strategy was born out of the victory of the Civil Rights movement and the riots sparked by police violence such as the Detroit riot of 1967. There is an elemental quality to such events that defies the plans of the cleverest politicians. The lesson from the DNC 1968 in Chicago closes a tumultuous year whereby the Right-wing emerges victoriously. The LEFT went off the rails of life, and the RIGHT emerges for the next 30 years as the ruling Party. It's not JUST the Detroit Riots, but after MLK's assassination in 1968, 110 US cities were engulfed in riots. Robert Kennedy was assassinated, President Johnson quit his job ... there were riots in France, Poland, Mexico, Nigeria ... there was a worldwide revolution and the LEFT was defeated (mostly from within) and the RIGHT won victories in France, Mexico, Poland and the USA. As for black citizens, the lesson learned is not to be confused by goofballs like Tavis Smiley and Cornel West. The stakes are too high to play Politics of Personal Grievances. Ron, we've got to stop agreeing on the main points. Yes there was a worldwide revolutionary upsurge that year. You left out the most important one: The Tet offensive. Now it's my turn to say GET REAL. Smiley and West aren't confusing anyone BHO is. In a previous exchange on the dear leader and these gentlemen you came out with your self help program and criticized West for not starting some kind of education program. In a shocking bit of crab barrel thinking on your part you wrote that West ought to recruit his friend Jay-Z to finance your scheme. As a believer in capitalism and the individualist ethos that system requires you ought to know that Jay-Z and West's main concern should be what profit rate they should expect from such venture. You should send your plan to BHO, as President he could just tell HUD to make the properties available. He could order the Federal prison system to release non violent offenders to do the work. He could justify the whole program as a bold initiative to reduce poverty and teach good citizenship to a deprived group. You could ask him to eliminate the sentencing disparity between crack and powder cocaine convicts. Why, oh, Why have these ideas never entered the dear leader's head. You and I probably agree more than we disagree. The Tet Offensive is in an upcoming post on the year 1968. You just keep getting me off my game. This should be a discussion on the 100 years post-emancipation when ALL blacks FINALLY gain citizenship rights. Oh my, you missed the point entirely. I'm not talking about PROFITEERING off of poverty. There is no PROFIT. No PROFIT motive. It should be considered a "charity." JayZ, Beyonce, MosDef, Prince would DONATE their services to raise "seed money" for the CHARITY. Not a Venture Capital investment, but a charitable donation. All materials, all services would have ZERO profit. If Cornel West and Tavis Smiley are SERIOUS about their poverty tour, then they would demonstrate the simplest economic formula: A-L = W (Assets - Liabilities = Wealth). The seed money is to procure assets to redistribute to the poor. You don't need a bunch of government bureaucratic red-tape to restrict your wealth building plan. Even under the BEST CASE President Obama will only be in office for 4 more years. And we all know what happens when another administration takes place, the funding gets cut, or there will be too many hoops to jump through and ladders to climb ... it never works out very well. So, if you want something sustainable, then you need to consider grassroots low/no cost. HUD houses are $1.00, rehab materials are almost at zero cost, the poverty people need building trade skills and THEY do the labor...the pay a nominal "rent" to put some skin in the game and after 7-10 years the ASSET is theirs. You will change their status as homeowners, owners of real estate, and skill building. What the heck is crab barrel thinking about that. I'm not keeping folks from rising, I'm offering them an escape route. I think its better to go below the radar and off the grid. Remember what happened to Fred Hampton when he fed the ghetto children free breakfast. If my timeline is correct, in 1969 Chicago's finest gunned him down while he was asleep in his bed about 1 year after the DNC Convention meltdown. Your scheme is predicated on the notion that rich Blacks have a special duty toward lifting other Blacks out of poverty. I labeled such thinking crab barrel thinking because, as I see it , crabs who attach themselves to other crabs in a barrel do so not out of a leveling instinct but as a way to break free from the confines of the barrel. Being the "wonk" you claim to be a little bit of grade school math should have disabused you of the viability of your scheme. The 10 richest American's combined wealth in 2012 was $347.1 billion (http://www.forbes.com/forbes-400/). Contrast their wealth to that of the 18 richest Blacks $9.425 billion (http://www.therichest.org/nation/wealthiest-african-americans/). The Whites were 36.82 times richer than the Blacks. If you invested the combined wealth of the richest Americans and got a 5% return on it in one year you would have generated $17.355 billion a year, that's almost twice the wealth of the richest Blacks in 2012. You wrote "Even under the BEST CASE President Obama will only be in office for 4 more years. And we all know what happens when another administration takes place, the funding gets cut, or there will be too many hoops to jump through and ladders to climb ... it never works out very well." The Emancipation Proclamation, The Voting Rights act, etc. ,though not perfect, have worked well enough. Who told you Obama won't cut funding for programs benefiting the poor? Have you ever even READ the Emancipation Proclamation? That document didn't free anybody, the 13th Amendment freed the slaves, not the Emancipation Proclamation. It did change the tide of the Civil War, but it took a Constitutional Amendment to actually free slaves. The Voting Rights Act is under CONSTANT pressure, even with the 15th and 19th Amendment the Constitution doesn't seem to apply to black people. I've posted plenty of times how RIGHT NOW, TODAY, that massive disenfranchisement is occurring as the Republicans treat voting rights like dog droppings on the bottom of their shoe. As far as your mislabeling of "crab barrel thinking." Cornel West and Tavis Smiley pimp-poverty. I'm not driving around on some stupid poverty bus throwing spitballs at the president. My premise rests upon the qualifying statement: "IF THEY ARE SERIOUS..." The evidence does not prove to be conclusive about the seriousness of either Smiley or West. It's not about aggregating black wealth vs. white wealth. The proposed measures represent a low cost method of growing assets. I NEVER said for JayZ et al to write ONE check or take ONE dime out of their own pocket, just give a benefit concert or two and DONATE the money as charity. That's one hour of time. Nonprofits give fundraisers all of the time, why can't we raise funds for ourselves. No sir I did not read the proclamation and I don't need to. I know that with that policy The North turned the property of the slave owners into freed men instead of returning them to their "rightful owners" and got the ball rolling toward making Blacks American citizens. Without the protection of the law how long do you think that your scheme would last. In your desperation to let BHO off the hook you keep coming up with more fanciful dodges. " I NEVER said for JayZ et al to write ONE check or take ONE dime out of their own pocket, just give a benefit concert or two and DONATE the money as charity. That's one hour of time. Nonprofits give fundraisers all of the time, why can't we raise funds for ourselves." You want them to DONATE their time instead of using their time to make money to enrich themselves, how is that fundamentally diferrent from asking them to write a check? As an individualist I would think you would find that they are the only ones qualified to make such decisions. The "Confiscation Acts" turned the former slaves into CONTRABAND of War, they weren't necessarily "FREE". The IRS taxes income donated to charities different from time donated to charities. It's like volunteering your time at a soup kitchen vs. writing a check to the soup kitchen. Volunteer time is not taxed, while the IRS taxes income and allows for a certain percentage of charitable contributions to be deducted from your 1040. Interested in corrugated tin fence designs? Browse pictures and videos of corrugated tin fence designs or share your designs on HGTV Rate My Space. Interested in corrugated tin fence designs?